The NCAA can be as unpredictable as midwestern weather when it comes to its investigations, so it’s hard to tell Texas fans to rest easy today. But if the most recent news coming out of the Myck Kabongo story is indeed true, it doesn’t seem likely that the Longhorns will be without the talented point guard this season. Myck Kabongo might be in the clear with the NCAA. Kabongo flew to Cleveland this summer for a private workout with childhood friend, former Texas teammate, and current Cleveland Cavalier Tristan Thompson. How Kabongo financed the trip is the reason behind the NCAA’s questioning. Yahoo! Sports originally reported that the trip was paid for by Thompson’s agent, Rich Paul, a clear violation of NCAA guidelines that could potentially have resulted in Kabongo ineligible to play this season. FoxSportsOhio is now reporting that Thompson paid for the trip rather than Paul. Because Thompson and Kabongo’s relationship goes back to their childhood, it appears unlikely that sanctions will come down on Kabongo or Texas. The NCAA this week released its annual financial report on on the spending patterns of its member institutions’ athletic departments, and the results, while not groundbreaking, are certainly interesting. The report (found in its entirety here) deals in aggregate numbers — meaning individual schools are not named — but the data from 2011 is still valuable. For example, among FBS (I-A) schools, the median revenue for a basketball program approached $5 million with profits of $812,000. By comparison, football programs created over $15 million of revenue with profits of around $3.5 million each. Because every other collegiate program from rifle (-$26,000) to women’s basketball (-$1.26 million) operates at a significant loss, only 23 of 120 FBS schools had a net positive revenue stream in 2011 (one more than 2010, but nine more than 2009). You don’t have to see their names on a report to more or less guess who the lucky ones are. ESPNU’s Recruiting Nation may end up with its highest rated October ever if it keeps this up. According to the Detroit News, elite Class of 2013 wing James Young will announce his college decision on the 5 PM episode this evening, and his choice will once again make for a very happy weekend in the Commonwealth of Kentucky. Young has been considered a UK lock for some time, especially after his home state Michigan State program discontinued his recruitment when a trip to East Lansing never materialized. Young is in everybody’s top 10 and is rated as the overall #7 player in his class, according to RSCIHoops. Along with the top five Harrison twins, John Calipari is well on his way to grabbing an entirely new starting five quite possibly filled with only top 10 prospects (Julius Randle, Aaron Gordon, and Andrew Wiggins if he reclassifies are still possibilities). Like him or not, the man has quite simply redefined college basketball recruiting. Down the road an hour in Louisville, the Cardinals’ head coach Rick Pitino would be wise to push his loaded squad to the Final Four in Atlanta and cut the nets down this year. But even if Louisville falters along the way, it appears that the 60-year old Pitino will have several more opportunities as he is now backing off his previous statements that he expects to retire in 2017. On a SiriusXM radio show with Jeff Goodman on Wednesday night, Pitino said that he expects to sign a contract extension and plans on staying on board as a head coach “for as long as [he’s] healthy.” We’ll say this, from personal experience — the Pitino we saw during last year’s Final Four run was as light-hearted and as happy as we’ve ever seen from the guy. He seemed to actually enjoy what he was doing again. From the top of the heap to the bottom… only two days before the start of practice, UMBC head coach Randy Monroe resigned his position, effective immediately. It was no secret that Monroe had struggled there in recent years — going a disastrous 13-77 in his last three seasons — but the timing of his resignation is incredibly odd. Monroe was the head coach at UMBC for eight seasons, taking the Retrievers to the NCAA Tournament in the 2007-08 season. His top assistant coach, 33-year old Aki Thomas, will take over this season on an interim basis. We’ll not speculate further as to the precipitating cause for such a weirdly-timed resignation, but we figure that if there’s a story here it’ll come out eventually. Finally, we have fresh news of an NCAA investigation of a player and it doesn’t involve an incoming recruit! CBSSports.com reported on Wednesday night that Texas point guard Myck Kabongo may have accepted impermissible benefits while working out in Ohio over the summer. You may be wondering what Kabongo, a Canadian who goes to school in Austin, Texas, was doing in the Buckeye State, but the answer relates to his former teammate (and countryman) Tristan Thompson, a current employee of the Cleveland Cavaliers. The question is whether Kabongo paid his own way for his travel and stay there, or if Thompson’s agent, someone by the name of Rich Paul (also LeBron’s agent) may have chipped in on his expenses. It’s probably not a huge problem even if Kabongo dipped into the pool a bit, as the preseason all-Big 12 selection likely would have to pay the money back and miss a handful of games as a result. But we’ll have to wait to see where this goes. Here are three thoughts about each team I garnered from Wednesday’s game in Chapel Hill. The observations on North Carolina probably hold a little more water, as the team is much more experienced. On the other hand, Texas will probably improve significantly between now and the end of the season. Reggie Bullock isn’t just getting love from bloggers for his defense; Roy Williams put the sophomore on Texas’ explosive J’Covan Brown whenever Bullock was in the game. Bullock’s length (he’s 6’7″) was definitely a factor, but he also did a very good job staying in front of Brown on most plays. After the game Williams’ one criticism was that Bullock didn’t box out well. But Bullock has earned the spot as the first substitute to enter the game (for Dexter Strickland), and his offensive skills make North Carolina a much more dangerous team when he’s in the game. 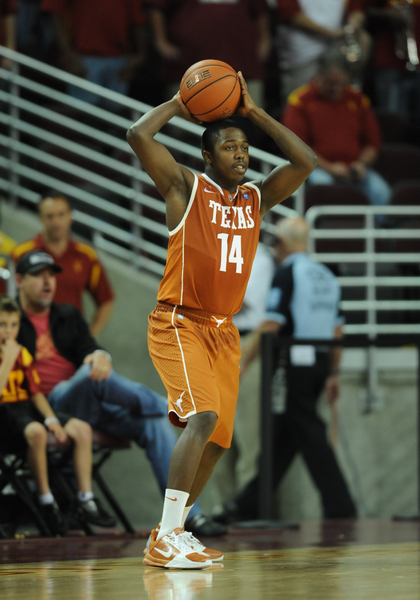 Texas needs Myck Kabongo and Rick Barnes on the same page. Last night Barnes benched his star point guard for a lack of “discipline” and “purpose” on offense. Without Kabongo, Texas isn’t nearly as dangerous. The forwards in particular really need a facilitator to create play-making opportunities. Kabongo is also lethal in transition. The bottom line is your second-best player can’t be riding the pine in big games. Reggie Bullock has Earned a Spot in North Carolina's Main Rotation. Harrison Barnes played his best game of the year offensively. Frankly, it’s not even close. Barnes scored in nearly every way possible. He scored in catch-and-shoot situations, isolation sets and on put-backs. He only had four offensive rebounds, but watching the game it felt like at least six or eight of his points came off those rebounds. This is the Harrison Barnes people were expecting when they picked him as a NPOY frontrunner. 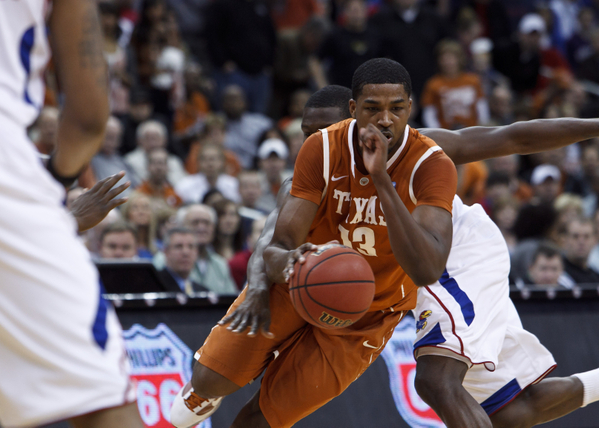 The 2009-10 season started out with high hopes and even higher poll rankings for the Longhorns. As we all know, after peaking at #1 in the nation for two consecutive weeks, the Longhorns collapsed in spectacular fashion finishing the season as a one-and-done NCAA tournament team. The 2010-11 campaign was quite the opposite. Expectations were not nearly as high yet the Longhorns thrived without the pressure, reaching a #3 AP poll ranking in February, defeating Kansas in Lawrence, and finishing 2nd in the Big 12. Did I mention that the Longhorns were not even ranked in the preseason AP poll? However, Jordan Hamilton and Tristan Thompson both opted to leave school early to enter the NBA draft so now Rick Barnes has a revamped roster and will have to show that the Longhorns are reloading this season and not rebuilding. J'Covan Brown Is Expected To Lead This Young Longhorn Team. The Stars: With Thompson and Hamilton gone, all eyes will be on J’Covan Brown. Brown will be the leader of this young, but talented Longhorn team. Last season, Brown averaged 10.4 PPG. I expect this number to nearly double, as he will be the focal point of this Texas squad. Brown is considered one of the better all-around basketball players in the nation as he can play aggressive defense, has great court vision, and can score in bunches. The Veterans: Often times, when you see a team with six freshman, you don’t expect there to be much upperclassmen leadership. The Longhorns, however, have a nice balance of both. There are no sophomores on the team, and there are five upperclassmen. The pair of seniors, Clint Chapman and Alex Wangmene, have not exactly put up stellar numbers in their team in burnt orange as neither averaged more than 2.3 PPG. While the juniors and freshman will do the majority of the scoring (a heavy, heavy majority), expect both of these players to be vocal leaders for the youngsters, a task that often goes unappreciated. NBA Lockout Speculation: Two-and-Through All But Certain? Today the RTC preseason All-America Team was announced, and it contains three sophomores on its first team who could have been viable 1-and-done prospects last spring had the NBA’s labor situation not been so tenuous. Those players are Ohio State’s Jared Sullinger, Kentucky’s Terrence Jones, and North Carolina’s Harrison Barnes. The second team has two more — Connecticut’s Jeremy Lamb and Baylor’s Perry Jones, III. The third team has two players who may declare for the NBA Draft after this, their freshman, season — Duke’s Austin Rivers and Kentucky’s Anthony Davis. It’s no secret that the top talent in college basketball these days tends to skew younger, as our inclusion of seven freshmen and sophomores to our three preseason All-America teams clearly exhibits. In a different year assuming those five sophomores were already in the NBA, we might have included more freshmen such as Connecticut’s Andre Drummond or Oklahoma State’s LeBryan Nash on our list. But we didn’t have to, and the reason for this is that the pool of talent is deeper this season than it has been for the last five years, in the same way that the last half-decade was more talented than the prep-to-pros era of the late 1990s and early 2000s. Official practices start in a little over a week, but players around the country are already involved in conditioning and individual instruction as the season quickly approaches. As a result, we’ll start to see an uptick in unfortunate injury news as was reported Tuesday that Missouri senior Laurence Bowers has torn his ACL and will miss the entire 2011-12 season. The 6’8″ forward is a massive loss for a Tiger team already thin across the front line, and it will be felt particularly in the hustle areas of offensive rebounding and blocked shots where the bouncy Bowers excels. Kim English will more than likely to slide over to Bowers’ position at the four, while center Ricardo Ratliffe, the Big 12’s Newcomer of the Year in 2010-11, will be asked to considerably increase his production of 11/6 per game. Missouri was the epicenter of college basketball news on Tuesday, as one day after the Big 12 unveiled its new revenue sharing plan for Tier I & II broadcast television rights, the school’s board of directors announced that it had unanimously authorized chancellor Brady Deaton to explore its conference affiliation options. The backroom snapshot of this, of course, is that Missouri thinks that will receive an invitation to become the SEC’s fourteenth member institution, bringing along the 21st and 31st largest US media markets with it (St. Louis and Kansas City). Whether this sets off another free-for-all of rapacious deal-making/breaking that sets the Big East and Big 12 completely on fire remains to be seen, but if Missouri ends up following Texas A&M southeast, the Big 12 will have to answer in kind. Western Michigan sophomore forward and Fab Five progeny, Juwan Howard, Jr., is transferring back to his hometown of Detroit to play at Detroit Mercy for his remaining three seasons of eligibility. Howard had a very successful freshman campaign at WMU in 2010-11, averaging 9/4 off the bench in just over 23 minutes per contest, and he will be eligible in 2012-13 at his new school. If Ray McCallum, Jr., is still playing for his father next year, a team that was already on the rise looks even better with Howard and McCallum in the lineup. With the NBA lockout continuing indefinitely (talks on Tuesday reportedly did not go well), Jeff Goodman checks in with several former NCAA stars who are currently back on campus earning a few more credits toward their college degrees. Duke’s Kyrie Irving, Texas’ Tristan Thompson, Tennessee’s Tobias Harris, and UCLA’s Kevin Love are but a few of the names current students are shocked to find in some of their classes this fall. Obviously, we think this is great and highly encourage these guys to continue along that path — we only wish more of them would see the value in it while they’re still in college, but alas… maybe the new NBA collective bargaining agreement will take care of that issue for us. We’re late to this article, but RTC alumnus John Gorman at GossipSports gets out his tin foil hat and begins connecting some of the open and notorious dots between the power players behind the scenes in the conference realignment discussions. His target: the marriage between IMG College and its client schools, ESPN and its conference affiliations, and all of the dollars flowing back and forth between them. It’s a really interesting piece, just try to not pay attention to the person opening his umbrella on the grassy knoll while you’re reading it. Zach Hayes is a editor, contributor and bracketologist for Rush the Court. 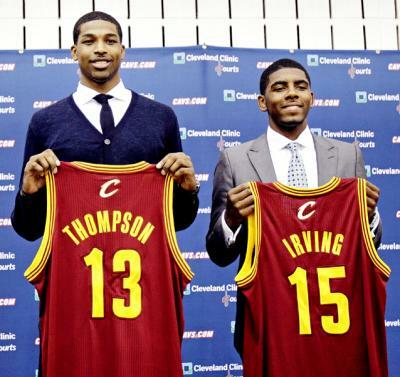 1 ) Cleveland Cavaliers- Kyrie Irving, PG, Duke. Any Derrick Williams-to-Cleveland rumor is searching for intrigue that’s simply non-existent. Irving was the pick the night the Cavaliers struck gold at the lottery and remains the pick today. Irving is a safe bet to develop into a dynamic player at such a vital position on the floor. 2) Minnesota Timberwolves- Derrick Williams, SF/PF, Arizona. Ideally, Minnesota would be eyeing a 2-guard, but they’ll have to swing a pre-draft deal to fill that need, as no shooting guard is worth taking this high. My money’s on GM David Kahn holding on to the pick and trying to trade Michael Beasley later. Williams has all of the skills to be an eventual All-Star. 3) Utah Jazz- Brandon Knight, PG, Kentucky. The Jazz are fairly set up front with Al Jefferson, Paul Millsap and Derrick Favors waiting in the wings, so look for #3 to come down to either Knight or Kemba Walker. Given Knight’s shooting ability, size and character, I see the former Kentucky point as the most likely choice. 4) Cleveland Cavaliers- Enes Kanter, C, Turkey. Rumors are spreading that Cleveland is looking to trade #4 for more picks to fill multiple needs, but passing up on Kanter here could be a grave mistake. The young Turk has a great attitude, impressed at the Chicago combine and could mold into the best post player in the entire draft. 5) Toronto Raptors- Jan Vesely, PF, Czech Republic. Toronto has a major need at power forward and worked out both Vesely and Bismack Biyombo this past weekend. The Raptors have been connected with Vesley since the first draft prognostications began and we see no reason to change our minds now. Vesley is a high-level athlete with commendable versatility for his size. 6) Washington Wizards- Kawhi Leonard, SF, San Diego State. Washington could be a candidate to move up to either #4 or #5 and take Kanter or Vesely. If they hold fort here, look for Leonard to be the selection. The former Aztec is a phenomenal rebounder and athletic freak that can instantly boost a position of dire need for the Wizards. 7) Sacramento Kings- Kemba Walker, PG, Connecticut. The Kings wouldn’t mind if Leonard fell to them at #7, but if Washington grabs him, point guard is the next choice with Tyreke Evans more suited as a scoring guard. This pick will come down to Walker, Alec Burks and even Jimmer Fredette. Walker could instill some character to a shaky locker room and can contribute immediately. Overview: The dreaded “tweener” label. Given to players who have the size for one position but whose game is better suited for another position, Tristan Thompson appears to be one of these guys. The Canadian import has a lot of things going for him — his explosiveness, lateral quickness, length and energy around the basket are tools that make him an intriguing prospect for a number of NBA squads in the low lottery picks. But his small forward size and a complete inability to shoot the ball with a semblance of a post move or facing up with any kind of consistency is a serious problem. Already 20 years old, Thompson has a significant learning curve ahead of him in terms of finding scoring opportunities apart from what is inarguably a great motor — the mechanics on his shot are poor, as evidenced by his 48.7% performance last year at the free throw line, and the athleticism advantage he enjoyed in Austin will be marginalized by equally strong athletes at the NBA level. His calling card in the League might eventually come at the defensive end, what with his seven-foot-plus wingspan, strong physical base and above-average lateral quickness. His bounce off the floor and anticipatory skills led Thompson to lead the Big 12 in blocks last year with 2.4 per game, and his containment of Arizona’s Derrick Williams (4-14 FG) in the NCAA Tournament showed that he can defend elite scorers. Based on his athleticism and effort, Thompson is certain to be picked in the top half of the first round, but the team that gets him is buying a mixed bag of future possibilities with this player, from future All-Star to out of the league in three years. Will Translate to the NBA: His body and athleticism translate well to the NBA, although he’s not exceptionally built compared to the level of athlete he’ll find there. His energy and effort, though, are areas where he may be able to separate himself. Motivation and desire are intangibles that are an underrated aspect of this game, but Thompson may be able to make up for several of his shortcomings through sheer will. As mentioned above, Thompson could also become an exceptional defender, one capable of guarding both power and small forwards if he eventually chooses to focus on becoming an elite player in that regard.